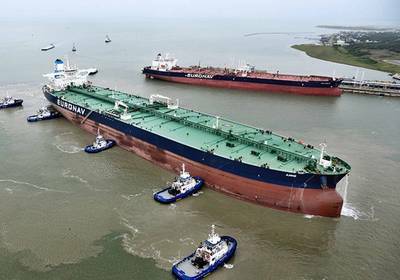 Liquids terminaling and logistics provider Moda Midstream announced it has successfully commissioned upgrades to Berth 2A at the Moda Ingleside Energy Center (MIEC) in Ingleside, Texas, to enable loading of very large crude carriers (VLCCs). Moda developed these upgrades to provide existing and potential customers the ability to safely and cost-effectively load VLCCs at rates of up to 80,000 barrels per hour. Moda also announced it has commenced a further expansion of its docks, which originally were designed by the U.S. Navy to support a battleship and aircraft carrier group. Upon completion, MIEC will have combined vessel loading rates of 160,000 barrels per hour and improved berthing efficiencies. MIEC has worked extensively with the U.S. Coast Guard and the Aransas-Corpus Christi Pilots to ensure efficient transit times and safe berthing of vessels. In addition, the Corpus Christi Ship Channel Improvement Project, when completed, will increase the depth from 47 feet below mean lower low water (MLLW) to 54 feet below MLLW, which will allow for the loading of increased volumes on VLCCs at MIEC. As part of the expansion program, Moda has commenced construction of an additional 10 million barrels of crude oil storage. Substantially all of the new storage tanks will be placed in service throughout 2019, and the expansion will be complete by the second quarter of 2020. As part of the expansion, Moda has begun construction of a new manifold and interterminal piping to allow MIEC to receive direct “basin to berth” deliveries from the Cactus II Pipeline, Gray Oak Pipeline and Epic Crude Oil Pipeline. These upgrades will be completed prior to the pipelines’ expected in-service dates. MIEC will be able to receive simultaneous deliveries from these three new “next generation” long-haul crude pipelines at their full mainline rates. Already one of the largest crude export terminals in the U.S., MIEC has approximately 2.1 million barrels of oil storage capacity and receives deliveries from the Cactus Oil Pipeline. MIEC has ample footprint for additional expansion opportunities.